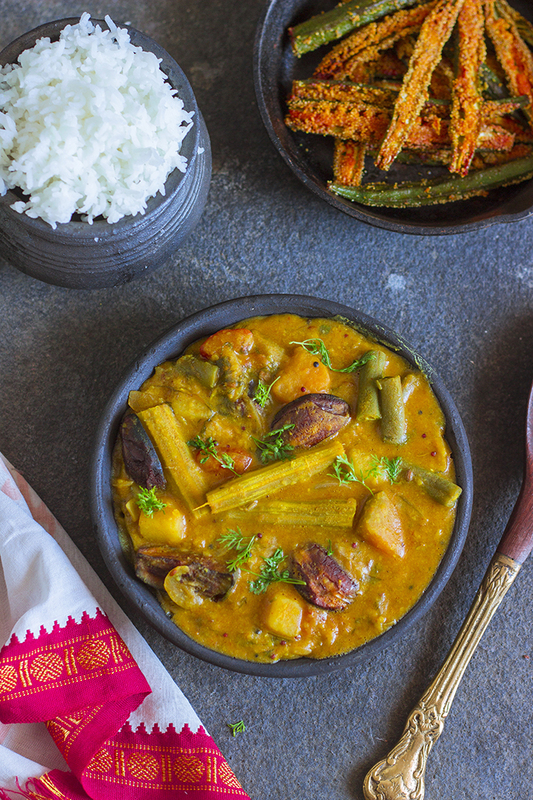 Doddapatre Tambuli is a traditional summer curry made with coconut and curd from Karnataka. 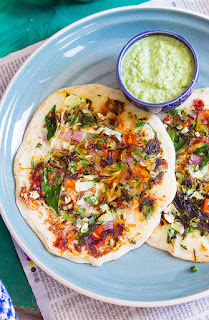 This curry is made with Mexican mint leaves or Ajwain Patta. There has never been a better time to make Tambuli or Thambli as now. This summer heat calls for eating something that cools your insides. 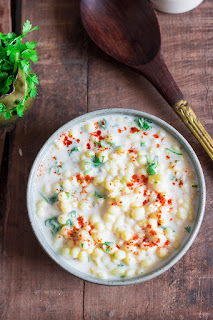 Every region in India has a yogurt (curd) based curry that is popularly made in summer. Tambuli is one of those curries in Karnataka. It is very similar to Majjige Huli, but is much simpler and cooler. The main difference is Majjige Huli is boiled, while the Tambuli is not cooked, hence, usually needs to be consumed fresh. Doddapatre is known as Big Thyme or Mexican Mint in English, Ajwain Patta in Hindi and Karpooravalli in Tamil. It is a leaf that has a pungent and distinct aroma that is closest to the aroma of bishop's weed or ajwain, although unrelated. Some people equate the aroma to that of oregano or mint. This distinct aroma and taste becomes mild when the leaves are combined with yogurt and coconut to make the Doddapatre Tambuli. My first interaction with this dish was at a Temple. On the coastal belt of Karnataka, there is a Lord Ganapati temple at Idagunji. When my grandfather frequented the place, one had to walk for miles together to reach it and it was hidden away tucked into a forest. I've seen the temple change from a small village temple to a quite popular one. When I used to visit the temple with my parents, it was still pretty small and the highway gave no indication to the tucked away temple. With no Google maps, one had to know the road before hand or had to ask the village folks for directions. It was here that they served a simple meal for lunch - Rice and Tambuli. It was and has been the only meal at a temple that I have relished. Tambuli can be made with a variety of greens, but the recipe differs slightly with each green. Some are cooked longer while some are used raw. Doddapatre is mildly sauteed until it turn slightly yellow and wilts, this makes them milder in taste. 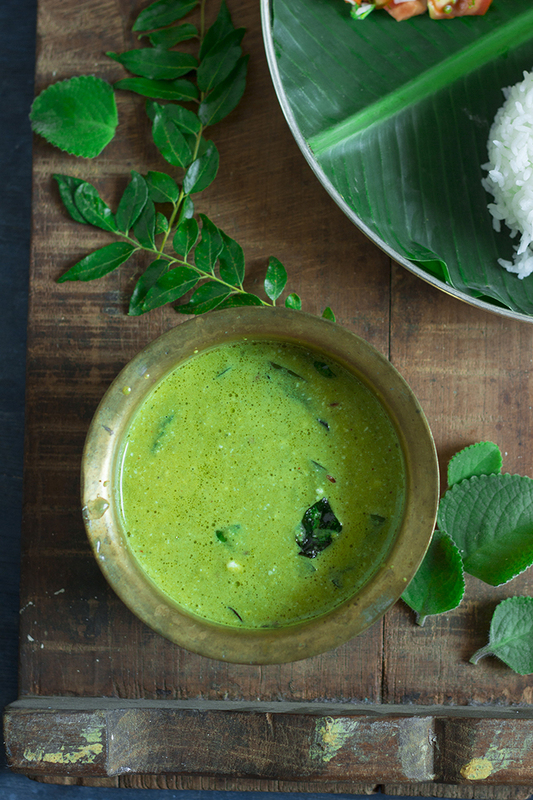 The browned leaves are ground to a fine paste along with green chilli and fresh coconut. Whisked curd or buttermilk is added along with some salt. Then a tempering of cumin seeds and curry leaves, and Tambuli is ready to be served. Tamuli is not heated again, unlike most other curries. Tambuli is served with steamed rice. P.S - This recipe has been reposted. The recipe was originally published in 2014. Images have been updated and a video has been added. The recipe remains the same. If you made this recipe, let me know! Leave a comment here or on Facebook, tag your tweet with @oneteaspoonlife on Twitter and don't forget to tag your photo @oneteaspoonoflife on Instagram. You can also email me at onetspoflife@gmail.com I'd love to see what you are upto. If you like this recipe, do not forget to share it with your friends and family! 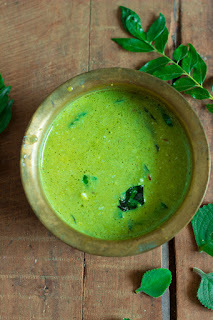 Doddapatre Tambuli is a traditional summer curry from Karnataka that is made with coconut, buttermilk or curd and doddapatre leaves, also known as Mexican mint or Ajwain Patta. 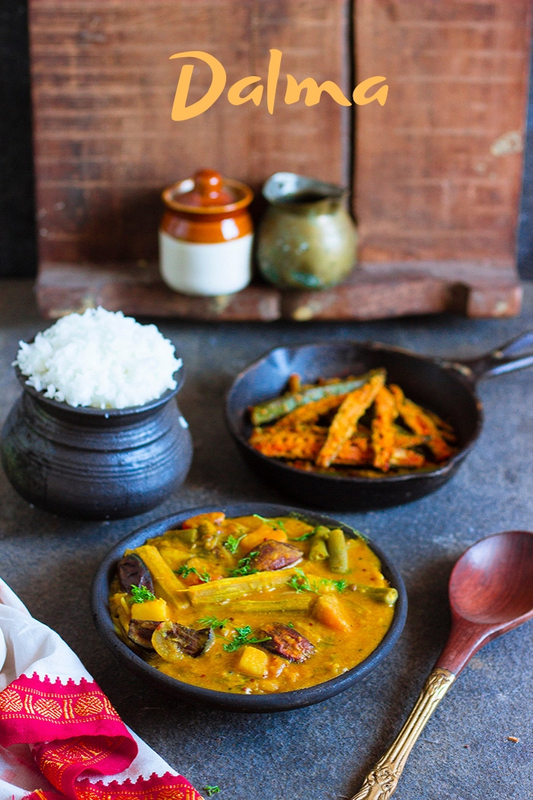 This cooling curry is served with rice. 1. Heat 1 tsp of oil in a pan and add the chopped doddapatre leaves. 2. Saute until the leaves wilt and turn slightly yellow. 3. Remove from heat and cool slightly. 4. Fry until the doddapatre turns slightly yellow. 5. Remove from heat and allow it to cool. 7. Heat oil in the pan and add the cumin seeds. Once they brown, add the curry leaves. 8. Remove the pan from heat and add the blended paste. Mix well. 9. Add in whisked curd or buttermilk. Add salt to taste. 10. Add in more water if it is very thick. 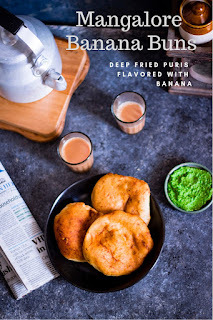 Uddina Vada or Medu Vada is a popular South Indian breakfast item. 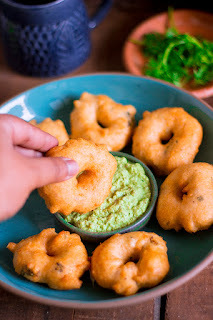 Medu vada is a savory donut made from urad dal or black lentils. Medu vadas are crispy and golden brown on the outside and soft and spongy on the inside. 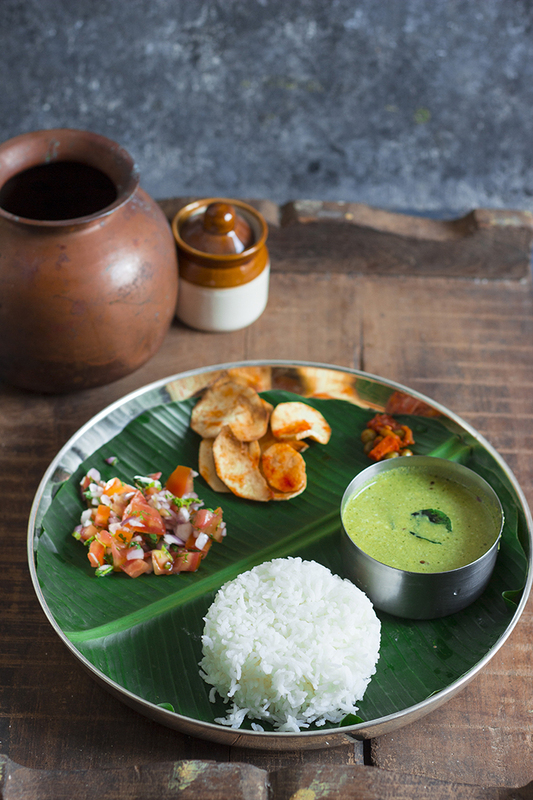 They taste best when served with fresh coconut chutney or dunked in a spicy hot sambar. It's raining!!!! and I'm pretty sure it is a crime to not eat crispy fried food when it rains. It isn't? Well, it should be. I recently mentioned in my Instagram post that Bangalore weather is as unpredictable. Summer unofficially started in early March this year and it's been blazing hot, hotter than ever, out here. Every year when it gets slightly hot, rains come and it cools off. Last year, when I tried to make a second batch of these sun dried potato chips, they caught mold due to the humidity. But this year there was no sight of rain or even a little cloud to shade us from the sun. Until now. The weather has been pretty unpredictable this week, just like Bangaloreans are used to. Heavy rains caught us off guard this week. And the evening rains are cooling down the city. And when it rains, eat all the fried food you can. 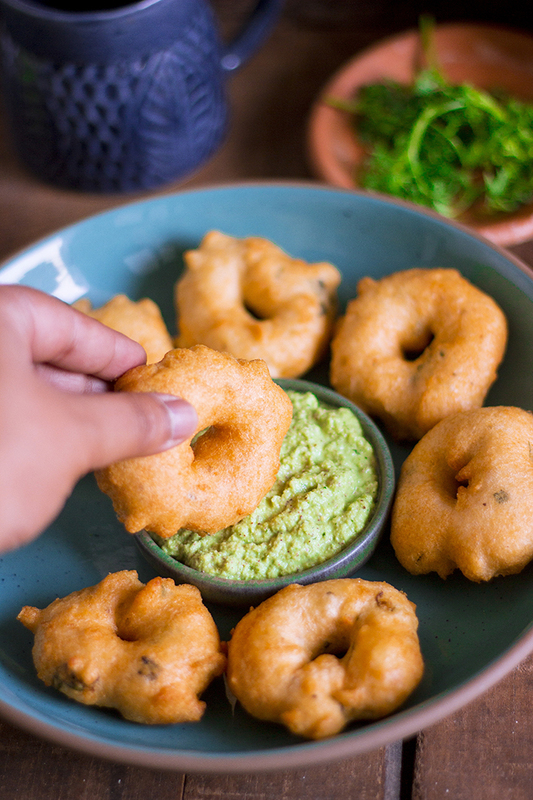 Frankly, Bangaloreans don't need a reason to eat this scrumptious crispy vada. Vada is eaten for breakfast, snacks, and may be lunch and dinner too. A plate of idli with one vada and a piping hot cup of traditional filter coffee, a simple soul satisfying breakfast for any South Indian. But the lazy me definitely needs a reason to make them at home. Uddina Vada or Medu Vada is a quintessential item on the breakfast scene of South India, not just Bangalore. The vadas are crispy golden brown on the outside, soft and spongy on the inside. When they are served piping hot with a bowl of fresh coconut chutney and a spicy bowl of sambar, one just stops talking and digs in. Contrary to popular belief, making these vadas at home is not difficult. But what can be challenging is to make that hole in the center. You cannot cut it as you would with a donut. 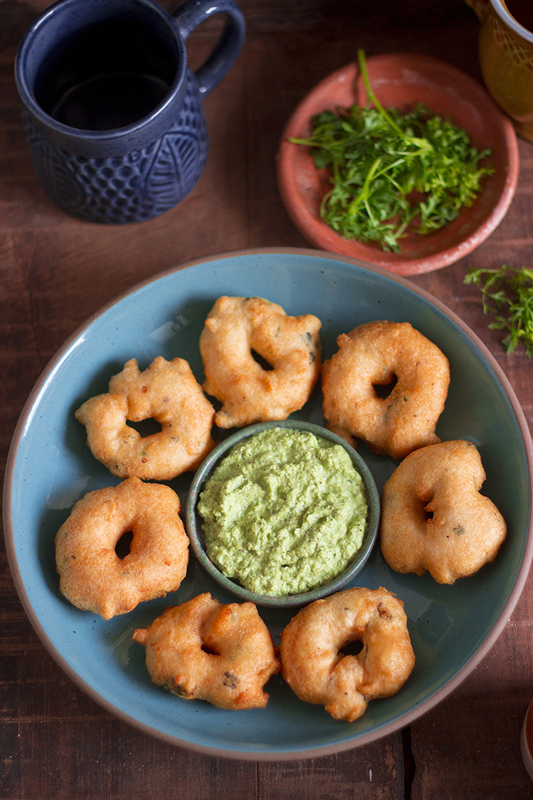 But there are a few simple tricks to making the perfect uddina vada, hole and all. Firstly, the batter has to be thick. As thick as it can be. The urad dal or black lentils, have to be soaked for just the right amount of time. 3-4 hours at max. More than 4 hours, and you will get a soggy batter that cannot be shaped. After soaking, completely drain the lentils and grind with as little water as possible until you have a smooth creamy batter. Secondly, for a crispy vada, you need to add in a little rice flour and a pinch of cooking or baking soda. Too much of the soda and you will have a very crispy vada that won't go well with the purists. Third, the flavor givers. Add in what you like to flavor the vada. Popular ingredients include cumin, pepper, curry leaves, coconut pieces, green chillies and coriander leaves. Add what you like in them. Also, add salt at the very end, just when about to make the vada, else the batter may turn soggy. Fourth, the hole. Making the hole isn't as complicated as it sounds. All you need is a thick batter and wet hands. Yup. Wet your hands properly and then take a dollop of the batter, use your wet fingers to make a hole and then gently drop it in the oil. If you are unable to make the hole for any reason, don't worry too much, just drop the batter in oil using a spoon. The hole is just for visual appeal and doesn't impact the taste or the texture. Five, the frying. To get a nice crispy exterior, fry for the first one minute of high flame. Then lower the heat and allow the vada to cook on the inside. Once the vada is the golden brown, it is ready to be served. Six, make extra. Well, this isn't a trick or tip, as much as an advise. Vadas are irresistible, always make extra. Wishing you a vada happy weekend!! If you made this recipe, let me know! Leave a comment here or on Facebook, tag your tweet with @oneteaspoonlife on Twitter and don't forget to tag your photo @oneteaspoonoflife on Instagram. You can also email me at onetspoflife@gmail.com I'd love to see what you are upto. 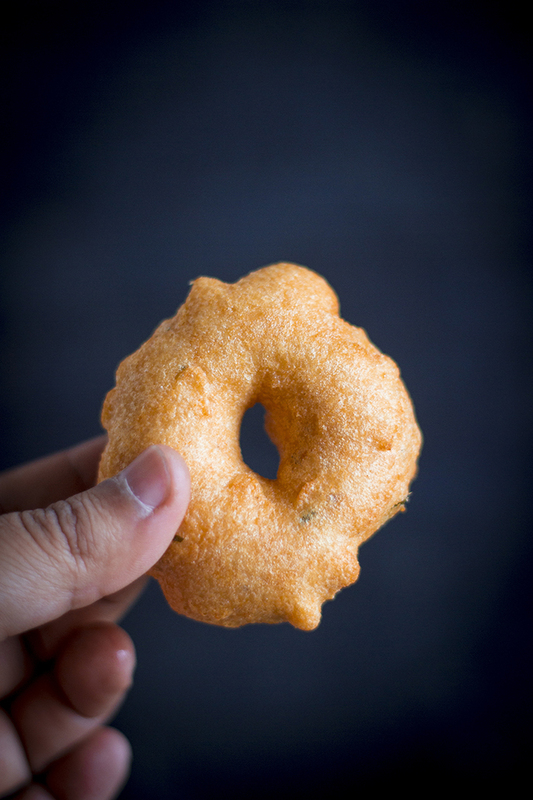 Medu Vada is an Indian deep fried savory donut made from lentils. 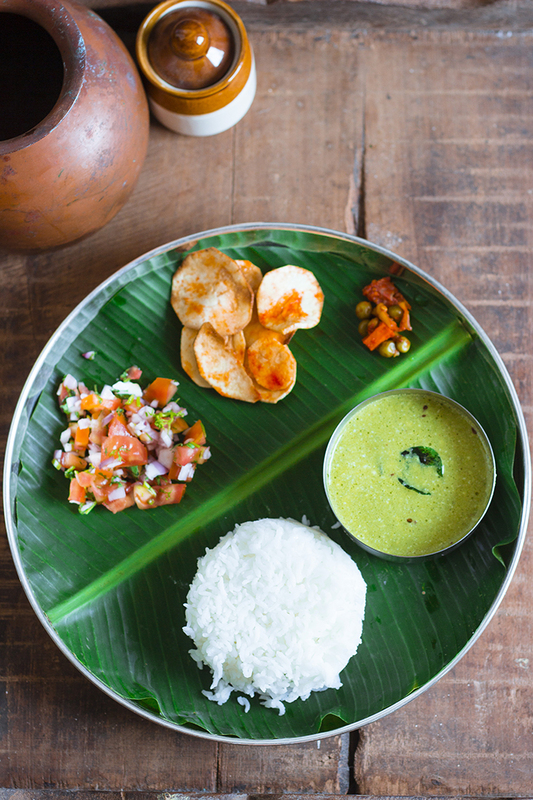 A popular South Indian breakfast along with Idli. 1. Wash the urad dal and soak the dal in water for around 3-4 hours. 2. Drain the dal and grind into a fine batter. Use as less water as possible. The batter should be thick. 3. Heat oil in a kadhai to deep fry the vadas. 4. While the oil heats, add in the rice flour, green chilli, pepper, baking soda and salt. Mix well until combined. IF the dough feels watery, add a little more rice flour. 5. Once the oil is hot enough, wet your hands and take a spoonful of batter onto your fingers. Using the wet finger of the other hand, make a hole in the center. Watch the video for help on how to do this. 6. Gently drop the vada in the oil. 7. Fry on high heat for 1 minute, then lower the heat slightly and continue to cook until the vada becomes golden brown. 8. Now gently slide this batter into the oil. Stir the vada occassionally and flip it, so that it cooks evenly. Cook until golden brown on both sides. 9. 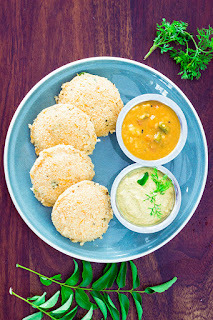 Serve the vada hot with coconut chutney or sambar. See the notes mentioned above the Video for tips on making the perfect Medu Vada. Kharbuja Panaka is a muskmelon based beverage that is traditionally served during the festival of Ram Navami in South India. Night Fury completes one year on Sunday, well, at least as per the Hindu calendar. Yay!! Sunday, the 14th is Ram Navami. And Night Fury isn’t our dragon, although Raj almost drives it as if it is, instead it is our car. When we bought it, we thought hard on what we should name it. Did you know there are websites out there that suggest names for your car based on color, type etc. They weren’t much help though. But after one hard look at the front grille of the car, and we both thought it looked like “Toothless” smiling. If you are totally lost right now, then all my references to night fury, toothless and dragons is from the movie “How to train your dragon”. It is a very good animated movie, and you should watch it. So now there are 2 reasons to celebrate the day, one of course cause it is Ram Navami, a festival, and second it is also birthday number 1. Ram Navami has always been a festival that invokes mixed feelings in me. As children, my mom took/dragged us to her family temple near Mangalore as Ram Navami is celebrated with a lot of grandeur there. While the festivities were nice and grand, what killed me there was the heat. April to me marks the beginning of Summer and Summer and the tropics don’t really work well together. While the tropics are always warm, Summer can literally roast you. And with Mangalore being on the coast, the humidity is very high too. So I was always sweating buckets and rushing to hydrate myself. The good thing was that any Ram Navami celebration always has cooling drinks being served. You are bound to find either Panaka or Majjige (buttermilk) being served to keep everyone hydrated. Last year I posted the recipe for a simple Panaka. 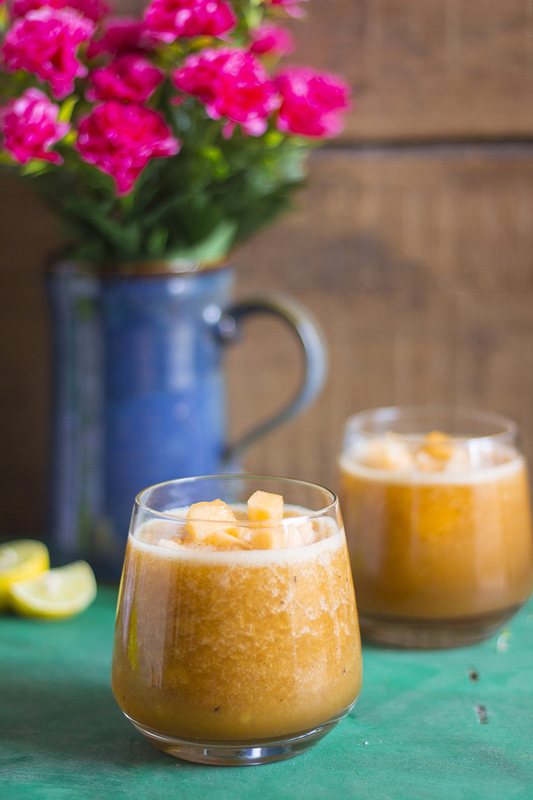 Today I'm sharing another version - Kharbuja Panaka or Muskmelon Sherbat. 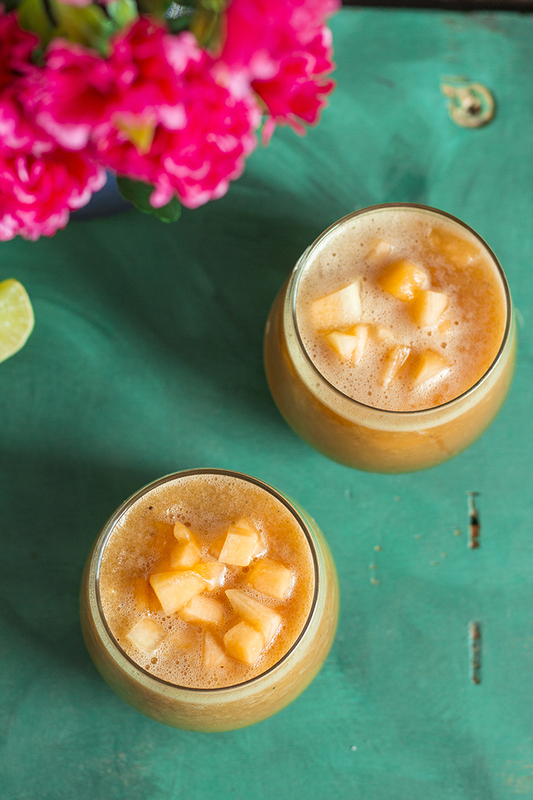 To make the Kharbuja Panaka, muskmelon or cantaloupe is juiced and cardamom, lime juice, pepper and jaggery are added for flavor. Chill it and serve it along with some diced muskmelon. If you are in the mood, you can also make this Bele Holige, that is traditionally made for all festivals in South India. 1. 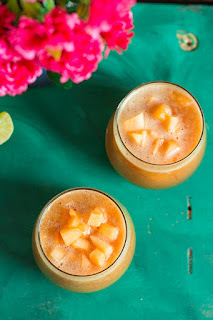 Blend the chopped muskmelon along with lime juice, 0.5 cup water, pepper and jaggery until smooth. 2. Start by adding 2-3 tsp of jaggery and increase as per the desired sweetness. 3. Peel the cardamom and crush the seeds into a fine powder. 4. Add the cardamom, remaining water and ice cubes to the blender and give it a quick whizz. 5. Serve it chilled. Top with muskmelon pieces before serving. 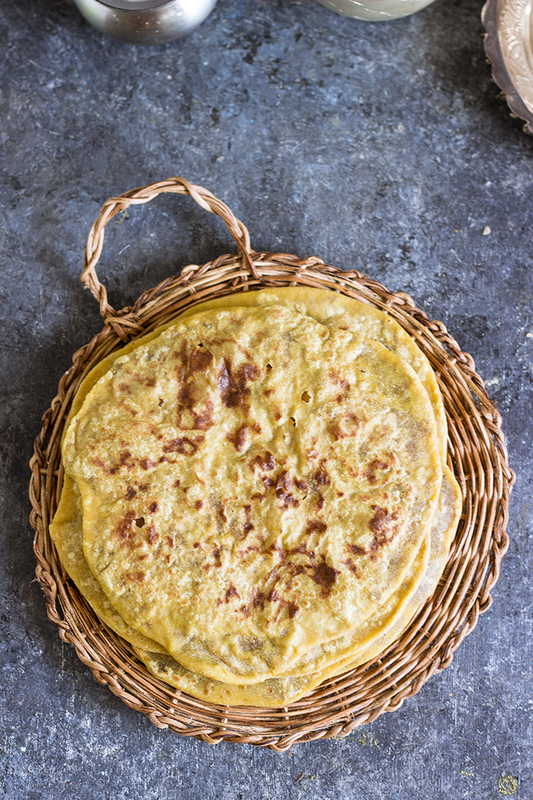 Bele Holige (Obbattu or Puran Poli) is a traditional Indian flatbread that is stuffed with a sweet lentil stuffing and pan fried in ghee. Popularly made for weddings and festivals. I confess, I have a sweet tooth. From the first drop of honey that I tasted as a baby, I’ve had that weakness for sweets. Time has proven, that my weakness for sweets is much stronger than my will power to ignore them. So instead of fighting a losing battle, I’ve given up and let myself enjoy them. After all, there is so much chaos and bitterness everywhere, at least my stomach can be full of sweetness. Of all the sweets I know, Holige has always been the crown jewel. You know how cakes are synonymous with weddings in the West, to a Kannadiga (people of the state of Karnataka), a holige holds the same place. When you are unmarried, a lot of the older folks in the family will inevitably ask you when you will treat them to a feast with Holige, which is nothing, but a nice way of asking you the nosy question of when will you get married. I know this from experience *rolling eyes*. So when we were planning our wedding menu and Raj declared he hates Holige, for a fleeting moment I wondered if he was the guy for me. Here I was in love with Holige, the quintessential wedding dessert and here was my man questioning its presence it our wedding. (May be he was jealous that I’ve loved it longer, who knows?). But my mom settled it by having 2 desserts, one that he liked and one that I liked. Wise woman. And both of us were happy. Now, the Holige is not a very difficult dessert to make if you follow your instincts, but until recently, it was something that had to be made at home. No sweet shop ever stocked it, and even if they did, it was never as good as the homemade ones. But recently, I’ve seen a lot of holige shops spring up around the city and they make some really good ones there. You will know how fond people are of Holige by just looking at the crowd at these stores. But we still love to make our own, because it is so easy and so delicious. A Holige is made of 2 components – the dough and the stuffing (also called hurna or puran). The dough can either be of only whole wheat flour (atta) or of only all purpose flour(maida) or a mix of the two. I’ve found that only whole wheat flour makes it slightly tougher in texture and only all purpose flour makes it chewier. The mix of flours works best for me. The stuffing is what gives flavor to the holige. Holige can be stuffed with a variety of things – lentils/dal, coconut, peanuts, and for the adventurous, there are dry fruits, dates and carrots too. While I love all varieties, this recipe is all about the lentil/dal or bele one. Chana Dal works best for Bele Holige. 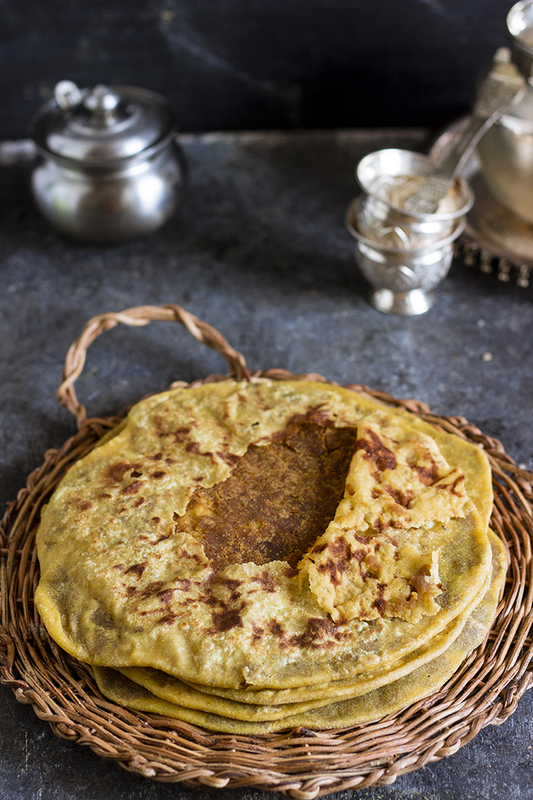 To make the stuffing, chana dal is boiled, drained and pureed with very little water until smooth and then cooked with jaggery until it forms a thick paste. This is flavored with cardamom for the minimalist, while you can add other spices like dry ginger powder or fennel seeds powder etc. Getting the consistency of the stuffing right is what all the fuss is about in making the holige. Like I said before, follow your instincts, and you won’t falter. You should be able to take the stuffing in your hands (once cool) and shape it into a ball that holds its shape. If it sticks to your hands or doesn’t hold its shape, it needs to thicken further. Put it back on the heat and allow it to thicken. If the stuffing powders in your hands, add a little water or milk and make it thinner. Once you have the right stuffing, the holige is very easy to make. 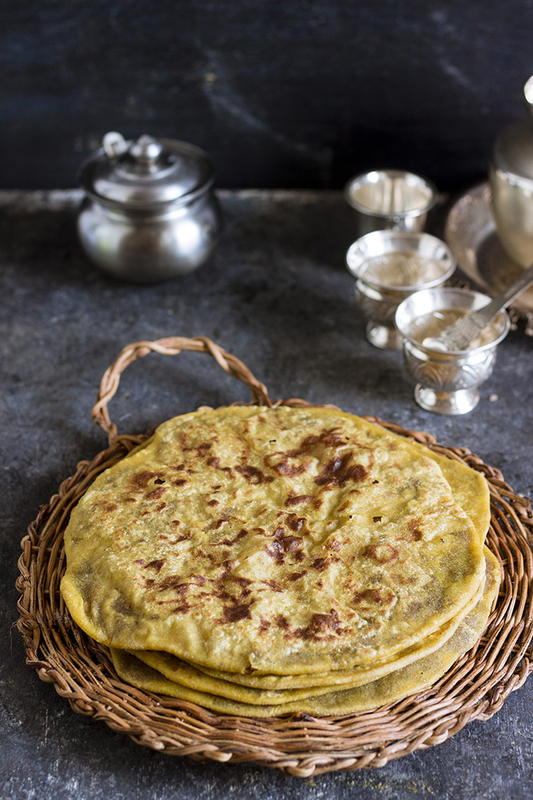 Holige is traditionally pan fried with a lot of ghee, but to make it vegan, use vegetable oil. I’ve made it with oil too and it doesn’t affect the texture. Holige tastes best when served warm, with lots of ghee or milk. 1. Wash the chana dal twice in water and then soak and leave aside for 30 minutes. 2. Pressure cook the chana dal with 2-3 cups of water until it is cooked. It may take 4-5 whistles or 8-10 minutes after the pressure builds up. 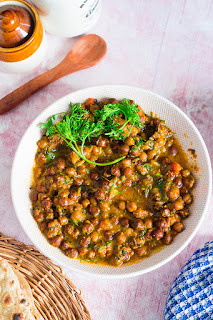 If not using a pressure cooker, cook the chana dal in a covered pan until completely cooked. 3. Drain the chana dal and allow it to cool. 4. Once cool, blend it into a smooth paste. Use as little water as possible. 5. Heat a non stick kadhai and add the chana dal paste to it. If you are not using a non stick kadhai, add a little ghee first and then add the chana dal paste. 6. Add in the jaggery powder and mix well. If you want a mildly sweet holige, add only 1 cup of the jaggery powder. You can taste the stuffing and add more if required. 7. Continue cooking the stuffing on low heat while stirring frequently until the stuffing thickens. It may take 15-20 minutes. 8. Add in the cardamom powder and mix well. Remove from heat and allow to cool. 9. If the stuffing feels thin in consistency after cooling, add it back to a kadhai and heat it again until it reaches the desired consistency. 10. While the stuffing cools, make the dough for the holige. 11. To make the dough, take the wholewheat flour and all purpose flour in a large bowl. Add in the turmeric powder and salt. 12. Knead it to a smooth dough with water. Add water as required. 13. Cover the dough and rest for 30 minutes. 14. To make the holige, take a lime sized ball of dough and roll it out into a small disc on a flour dusted surface. 15. Take a lime sized ball of stuffing and place it on the rolled out dough. 16. Seal the edges and roll out the holige as thin as possible. Dust the holige with flour as required. 17. Heat a tava and grease it with ghee or oil. Place the holige on it. 18. Spoon ghee or oil on the other side of the holige. 19. Cook the holige on medium to high heat until both the sides are cooked. 20. Remove from heat and serve with ghee or milk. Dalma is a popular mix vegetable dal based curry from the region of Odisha in India. A variety of vegetables are simmered along with dal to give a delicious curry that is usually served with steamed white rice. Caution, this is not a Summer Recipe. But I still love it and can eat it anytime. 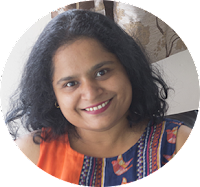 The curiosity all started with a restaurant in Bangalore named Dalma. I would cross it and wonder what the name means. I had no clue it actually referred to this very popular classic Odia or Oriya dish. And then we met, me and Dalma, the curry, not the restaurant. The restaurant is still a mystery, never stepped in there. Dalma was introduced to me by my neighbor who had an Oriya cook. He was fond of cooking his traditional cuisine once in a while and I loved it the first time I ate it. Unfortunately, I never took the recipe from him, but my neighbor who watched over him at times, gave this recipe to me. I have read online that there are different recipes of Dalma, some use coconut, some use onions, some use neither. I believe each region has adapted the dish to what is available locally. The coastal belt uses coconut while the interior regions do not. The Odia folks love Dalma so much that it is also served as a part of Chappan Bhog in Puri's Jagannath Temple. 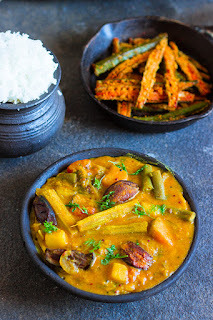 Dalma is a very simple mix vegetable curry that is also very healthy. The dal is full of veggies and barely has any oil. The only oil used is that in tempering. 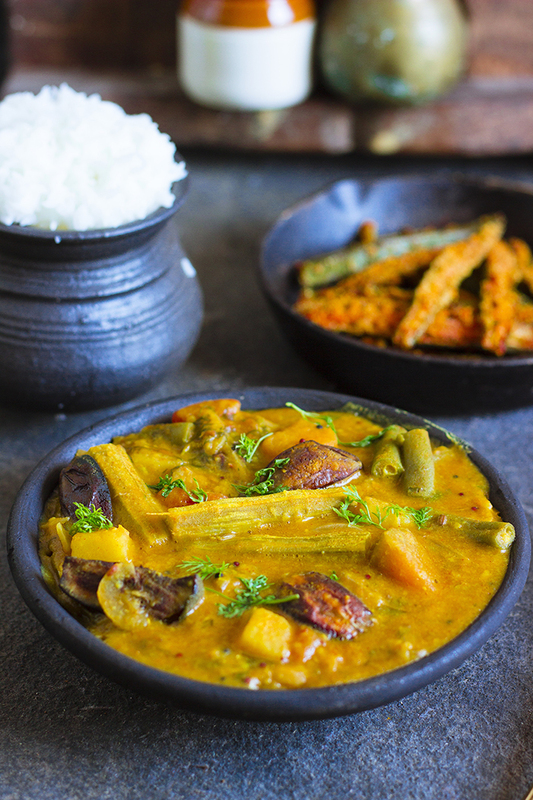 Dalma is a hearty and wholesome curry that is usually served with Rice or Roti. If you plan to serve it with roti, add less water to keep the curry thick. Each variation of the recipe may use different vegetables, use what you can get your hands on. Vegetables that need time to cook are added in the beginning and once they are partially cooked, the faster cooking vegetables are added. The Oriya cook used to cook the dal in the same pan and while the dal was still cooking, he added in the veggies. I just sped up the process by using already cooked dal. Some folks may also use Chana Dal instead of Toor Dal or a mix of both. Wishing you a warm and comforting weekend with Dalma! 1. Add cooked toor dal (lentils) to a deep pan or kadhai. Add water as required and 1 tsp turmeric powder. Mix well. 2. Add in the drumsticks, raw banana, pumpkin, potato and beans. 3. Add salt to taste. Cover and cook until the vegetables are half cooked. 4. Add in the brinjal and cover and cook until the vegetables are almost cooked. 5. Add in the chopped tomato and cook until all the vegetables are cooked. 6. Adjust seasoning if required. Remove from heat and keep aside. 7. To make the tempering, heat mustard oil in a pan and add the panch phoran spice mix. 8. Once the spices splutter, add in the bay leaf and sliced onions. 9. Fry until the onions are translucent. 10. Add in red chilli powder and the cumin powder and saute for 1 minute. 11. Add the Dalma to the tempering and simmer for 5-6 minutes. 12. Add water if required. 13. Garnish with the chopped coriander leaves.